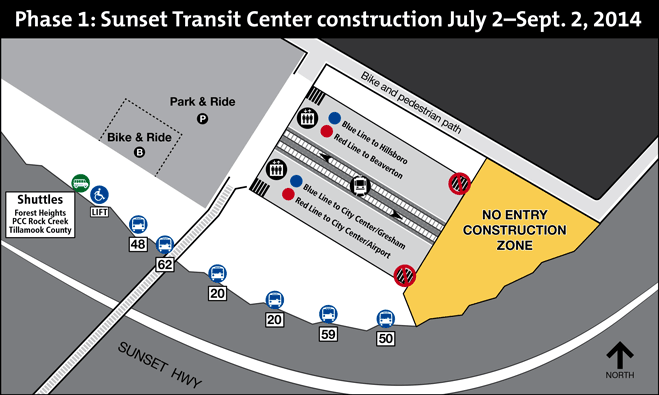 TriMet’s Sunset Transit Center MAX Station will soon be undergoing major platform maintenance. Work will begin on July 2 and run through the end of September, with a focus on minimizing impacts on riders. The multi-phase construction project is part of TriMet’s continued investment in MAX system. The station, which opened in 1998, is in need of essential updates including repaving the platforms. TriMet and the general contractor, Brown Contracting, Inc., will be completing this project in phases. All MAX and bus service will be maintained during this phase. Access to the platforms will be maintained via the stairs and elevators on the west end of the platforms. The stairs on the east end will be closed. Platforms will remain open. At times the back half of the platforms will be fenced-off to allow the contractor to complete this phase of platform reconstruction. Signs will be posted to give riders information on accessing the platforms. People who live and work near the transit center may notice some noise between July 7 and September 3 during the early morning hours (1–3:30 a.m.) as crews cut the current pavement. TriMet is committed to maintaining access to MAX platforms during the bulk of construction. This requires that TriMet and our contractors complete this work when the platforms are not in use. Chances are you may not be bothered by the construction noise. We are working to complete the construction in as short a time as possible and appreciate the public’s patience with the late night work. Sunset Transit Center MAX Station will be closed for about 16 days. Trains will continue to run between Hillsboro and Gresham, however, they will not serve the platforms at Sunset TC. Regular bus service to Sunset Transit Center will remain the same. All lines that currently serve the transit center will continue on the regular schedule. Lines include the 20, 48, 50, 59, and 62. Vehicle and bike parking will remain open during this time. Frequent shuttle bus service will be provided from Sunset Transit Center to Washington Park or to Beaverton Transit Center where riders can transfer to trains. For future information and updates, please visit trimet.org/sunsetclosure. TriMet is committed to reinvesting in our rail network, making upgrades to ensure that our rail system remains a safe, reliable and efficient transit mode far into the future. With July 1, the beginning of TriMet’s Fiscal Year 2015, comes the launch of many State of Good Repair – Renew the Blue projects that will improve system reliability and on-time performance throughout the MAX system. Other major projects to begin this fall include Blue Line station rehabilitation on the eastside, replacing switches and turnouts at NE 11th and Holladay, roughly $500,000 of improvements to the Steel Bridge, and the platform reconstruction at Sunset Transit Center. For more on FY15 budget and improvements visit news.trimet.org.